The Tomorrowland Speedwayat Magic Kingdom is one of the exclusive community of rides that have been in place since the park’s opening in 1971. 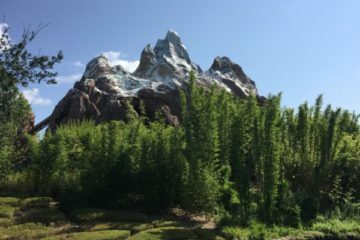 While not a thrill ride in the same tier as Space Mountain and Big Thunder Mountain Railroad, the interactive nature of the attraction has made it popular with older and younger visitors alike. 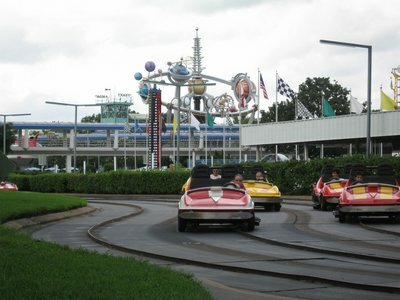 Like many attractions at Magic Kingdom, the Tomorrowland Speedway was inspired by a similar attraction at California’s Disneyland Park. At Disneyland the ride is named Autopia, and was one of the original attractions that debuted on the park’s opening day in 1955. This ride earned its location in Tomorrowland for its celebration of the smooth multi-lane freeways that, way back in 1955, existed only in the imagination of transportation engineers. However, by the time Magic Kingdom was under construction in the late 1960s, interstate highways were commonplace. 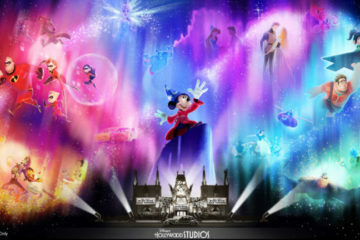 In order to keep the ride on the cutting edge, Disney Imagineers re-themed the ride as a celebration of the constant pursuit of greater speeds on the world’s race tracks. In consequence, the ride was named the Grand Prix Raceway. In place of the bulkier cars at Autopia, which were based on road cars of the time, the Grand Prix Raceway vehicles were low slung and painted with racing stripes to better evoke grand prix race cars of the time. Disney expanded the ride in 1973, but shortened it again in the 1980s in order to make room for the new Mickey’s Toontown Fair (then named Mickey’s Birthdayland). Tomorrowland was thoroughly remodeled in 1994, and this remodel included changing the name of the Grand Prix Raceway to the Tomorrowland Indy Speedway. 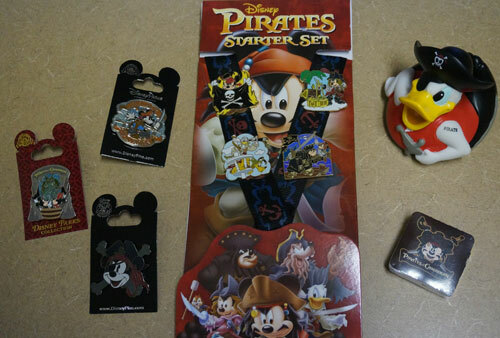 Additional changes in 1999 removed theming in line with the international Grand Prix circuit in favor of items from the Indianapolis Motor Speedway. 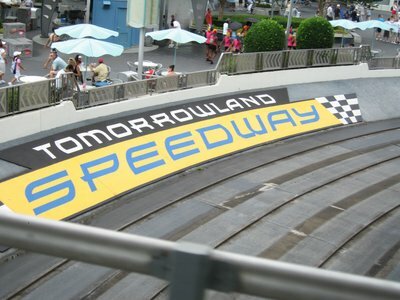 Although the name was changed again in 2008 to the Tomorrowland Speedway, the Indy theming remains throughout the attraction. It’s not a thrill ride, but the interactive nature of the Speedway makes it popular. The Tomorrowland Speedway features four lanes of track that circles around a 0.4 mile loop. The cars ride on rails to keep them in line and limit collisions, although the span of the wheels is a bit wider than the width of the rail in order to allow riders to actually steer the cars. The cars also feature a gas pedal, allowing each driver to power the car at any speed up to seven miles an hour. This is not very fast in the real world, but in the scaled down world of the Speedway the landmarks still seem to speed past. Among the imagery that creates the feel of the Indianapolis Motor Speedway are pictures of famous racing drivers and panels in the loading area celebrating three races that regularly or periodically take place at the famous course: the Indianapolis 500, the Brickyard 500, and the United States Grand Prix. Fans of Indy Car racing may also recognize the wing and wheel logo, a replica of the Yard of Bricks, and Gasoline Alley. The attraction even features a Victory Circle at the end of the course, and a covered bridge where non-riders can observe the “race”. The interactive nature of this ride is one of its attractions, but also a potential source of frustration. Chief among those frustrations is something that you won’t find at any full size raceway: traffic. Since each driver can control the speed of his or her own vehicle, riders who want to zip around the race track at full speed may find themselves stuck behind a slower driver. With each vehicle restricted to a particular track, there is no way for the speedier drivers to pass the slower ones. Drivers who want to stick to slower speeds around the course should also be aware of the potential for bumps from behind as faster cars catch up. Each Tomorrowland Speedway car is equipped with forward and rear spring bumpers, and at a maximum of seven miles an hour these bumps are never too uncomfortable. However, parents with young children who are frightened of higher speeds should also consider whether they are likely to be scared when the ride turns into bumper cars. Sometime you may get stuck behind a slowpoke on the Speedway. Children may ride this attraction once they reach 32 inches in height, a milestone usually reached by all but the smallest toddlers. However, children must ride along in the passenger’s seat with an adult behind the wheel until they reach 54 inches tall (typically 7-8 years old). Riders under the age of seven who meet the height requirement may drive as long as they are accompanied by a passenger age 14 or older. Each of the four lanes for the Tomorrowland Speedway board separately from lines that split off from the main line. The cars are free loading, meaning that each lane boards as quickly as the cars on that track return from the course. Much like choosing a checkout line at the grocery store, each line will move at slightly different speeds from the others depending on the speed of the people in front of you. 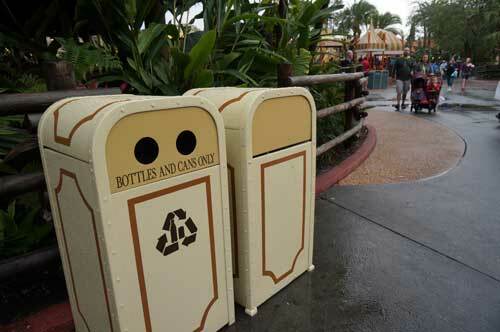 Riders should also be prepared to wait a bit at the end of the ride, as they wait for the cars in front of them to unload and load at the boarding platform. 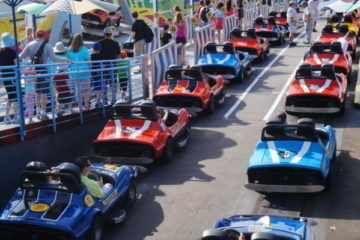 Wait times for the Tomorrowland Speedway have become fairly long, and Disney now offers a FastPass for the attraction. 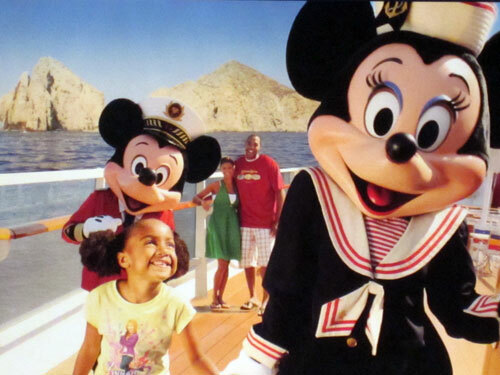 The FastPass allows visitors to return during a one hour window and enter a shorter line for a given attraction. Keep in mind that park guests may only hold one FastPass at a time until they reach the hour printed on their FastPass ticket. Guests should be sure to request a FastPass for rides that are a high priority, since it may be several hours until they can request another pass. Rumor: Tomorrowland Speedway Getting an Update?